If your data is so sensitive you need an encrypted file, don’t upload it to a third party service; simple as that. If you want to pick the archive’s name, that’s an extra step requiring user intervention. If you copy the archive’s password to the clipboard, you lose the archive’s link on the clipboard — yet another step. Every single one of those options is a bad experience. 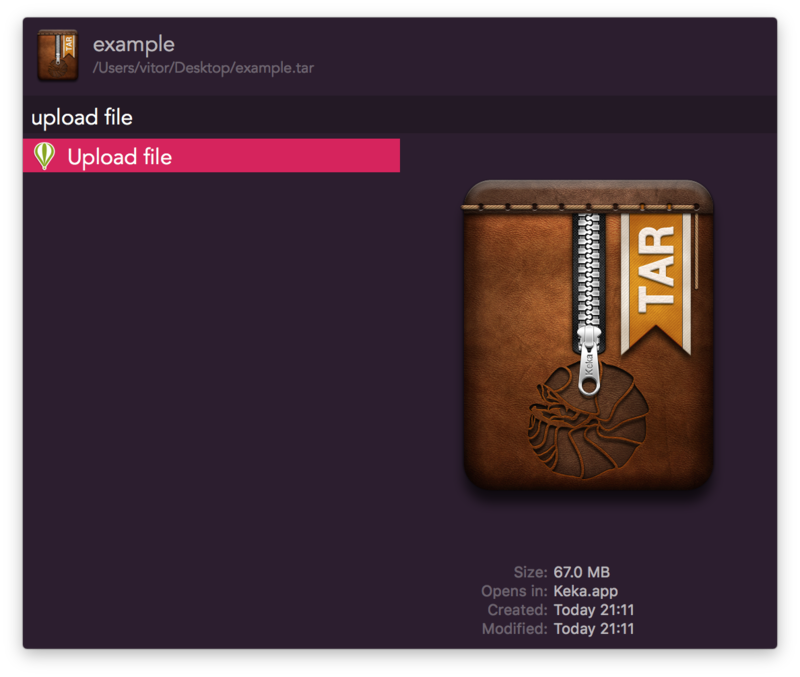 I built this because I wanted a quick way to upload files fast without having to think too much about it: tell it to upload, be informed when it’s done, paste the link; that’s it. To achieve what you want, the workflow would have to become radically different, and worse in all the metrics I care about, so I definitely won’t work on implementing those. The code is dedicated to the public domain, though, so anyone is absolutely free to fork and change a copy of it however they want. Fixed bug that would prevent uploads if there were brackets in the file path. Small improvement to how it calls itself when checking upload status. This doesn’t use any special hotkey. It uses the same hotkey as every other Alfred file action. It also has other good Alfred integrations like allowing you to navigate there with Alfred itself and act from there. Asking the Finder for the file locations with AppleScript is a bloody mess, and not something I’ll go into (I know how much trouble it is). The sheer amount of escaping and edge cases for special cases is really not worth it. I will look at a well constructed pull request, but won’t implement it myself. It’s really not worth it. Also made other general improvements (it should look mostly the same to you). Checking upload progress now auto-refreshes. Uploading multiple Files is not possible, right? Only folders work. Would it be possible to add support for multiple files in the same fashion as folders (zipping the files, than uploading)? Add support for uploading multiple selections at once. It now uses notificator for notifications. Please tell me if something goes wrong (if you get any error or stop receiving notifications). If everything works fine, I’d also be interested in knowing. Main reasons for the switch to notificator are in the DownVid post. Since the last update, the download URLis not copied to the clipboard. ?? @Grug transfer.sh is currently down. Do not create resource forks when zipping directories. To update, download the latest version (same URL) or wait a few days and it’ll prompt you to on next usage, since it uses OneUpdater. Added support for four extra hosts. See top post for details. Is it possible to make this workflow work as a file filter somehow? I hate using the filebrowser but I really want the features of your workflow. Do you mean a File Action? It does work like that. It’s the only method I use. I've read your instructions on how to change host several times but I have no clue where to look. Heh thanks for the reply. I actually deleted my post cos I asked the same thing years ago I saw when I scrolled through this. I meant that I seek the ability to launch it with a keyword directly from finder. Removed explanation as it was wrong (I was thinking of a Hotkey, not a Keyword). Are you guys talking about a Keyword or a Hotkey? Ah, right, I’m talking about a Hotkey, yes. I see that in my previous reply I mentioned I’m not going to add a Keyword because it’s not worth the trouble.